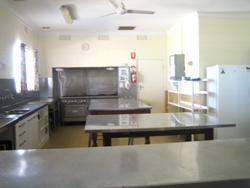 Camp Kedron is a sole occupancy camp and consists of three main buildings; a hall and kitchen complex with heating and air conditioning, moveable seating and tables, ideal for indoor activities and two bunkhouses (each consisting of 6 dorm rooms of varying size – please see the camp map downloadable here). Camp capacity is 96 beds. 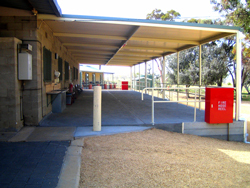 Caravans and tents are welcome to expand capacity on non-powered sites. One bunkroom (room 6) is disability accessible, and a disability bathroom is also provided with shower chair and rails. 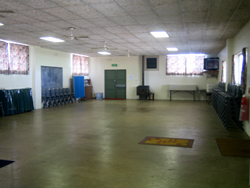 The main hall is wheelchair accessible. We welcome campsite inspections prior to booking. 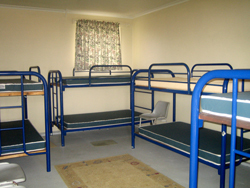 It is possible to move some bunkhouse furniture to suit the needs of people with special access requirements. 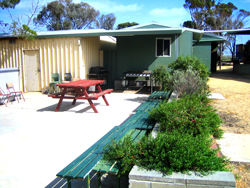 Outside there is a large BBQ area, plenty of shady gum trees and spacious lawns, ideal for playing sports of all kinds, and easy supervision. On site recreation facilities also include volleyball, table tennis, basketball, a pool table, and eight 2 person canoes with life jackets (for a small additional hire charge).